I am kind of super excited I am a day ahead in the 31 Day Challenge. It gives me a little wiggle room in case I lose steam during the month. I decided to kill two birds with one stone because I was itching to use some of my neglected purple polishes. I avoided water marbling. I tried a couple of times but they were fails and I felt discouraged. I attempted ziploc marbles but I was too impatient for them to dry so I tried a toothpick marble. It is hard! I kept scraping my base and I could not really “marble” but I liked the end result. Without top coat, the design resembled the Picasso Swirl technique; with top coat, it looked a lot more like what I was after. I hope you like my manicure today! I like the cloudy, floaty feel (if that makes sense) of the creams on top of the flaky base. I started with 2 coats of Zoya Payton and 1 generous coat of Nfu Oh Opals Nfu 51 (one of my severely neglected polishes…sometimes I wish I used it more, sometimes I want to save it because it was discontinued!) as my base. 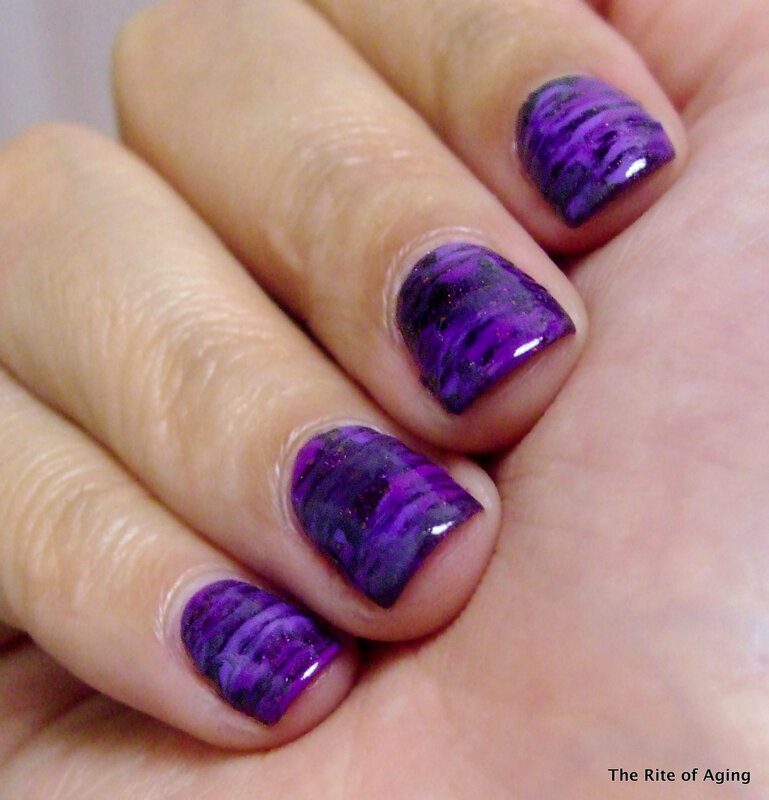 I marbled with a toothpick, Sephora by OPI Domestic Goddess, Essie Smokin’ Hot and Milani Vivid Violet. Check out the other violet nails for the 31-Day Challenge! …and the marble manicures for the Theme Buffet! I am also going to do the needle drag method for the marble prompt! Water marbeling is still to intimidating for me! I really like your purple marble!